In the Off-Grid Power Generation World, especially when it comes to micro wind turbines, the name Superwind is synonymous with survival. Of course the reason, most professionals will use only this commercial/professional rated equipment, is they likely have had to use something else in the past, and it didn’t work very long. And, for those same professionals, “survival” isn’t enough – it has to make reliable power. Superwind turbines do both. 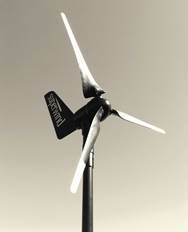 Micro-wind turbines (electric wind generators typically 100 to 2000 Watts) have been around for well over 50 years. They were fun for hobby types, useful for sailors on sailboats who knew when to leave them off, so they did not self-destruct in high winds. There was high speeds, noise and vibration. 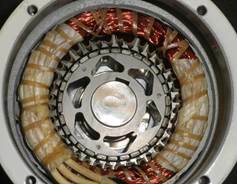 All kinds of rotors combined with an alternator, were sold as “wind turbine”. Some of these products had properly balanced rotors and worked nicely at medium winds – but the main characteristics of nearly all of them, was the absence of an efficient and reliable technical concept to survive gales and storms. If nobody was around to stop these turbines by any means before the storm, they just blew apart. These turbines were simply not designed for autonomous operation as there is no place in the world free of storms. So it is no wonder why so many off-grid professionals as well as their customers who paid for these types of hobby wind turbines had a very bad feeling about “wind”. One really could not blame them. When Martin van Egeren and Klaus Krieger founded superwind GmbH in 2004, they had the goal to change this – and brought to the industry some much needed common sense and some good German Engineering. By working directly in the field with off-grid end users, superwind could focus on the real world need. And they knew, it is all a matter of quality. But it is not only the quality of the materials, parts and components. It is the quality of an integrated concept to allow autonomous operation by preventing over-speed. Over-speed is one of the most well-known turbine terminating factors. When a low quality turbine is launched over-speed by high winds, it rapidly starts shaking its mast or rigging, it heats up and wears out its bearings, it overpowers its stator and is forced to either absorb the energy as heat, or discharge high amperage into the charge controllers and/or overcharge fragile but expensive battery banks. Basically in wind turbine terms “over-speed” means repeated steps of escalating damage until the ultimate failure of some, or all, of the equipment is reached. Superwind Turbines avoid over-speed operation through their patented and real world proven auto-feathering blade system. This is not new to us. We have been proving the worth of this advanced robust technology for over a decade. How it works is one of the best questions our customers ask: As the force of the wind moves the turbine into rated power speeds (about 25 knots), at this point the blades automatically change their pitch into an angle to reduce their aerodynamic lift, in real time. 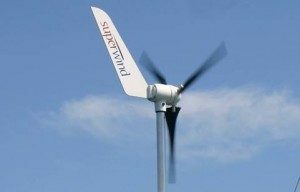 This means the blades’ ‘feathering action’ occurs in micro-moments, and the blades automatically recover to their normal position as the wind force lessens. The blades can actually pitch up to 40 degrees! The technology that allows this simple operation is quite remarkable, yet is robust enough to operate for a decade or more – even in Arctic and desert conditions. Yet, ultra quiet operation, an Auto-Feathering Overspeed-Avoidance system, the highest quality saltwater materials and proven power production in modest to high winds, is still not enough to satisfy the engineers at superwind. With nearly thirty years of wind turbine experience, we at superwind knew that our customers needed more. We knew that a turbine does not work by itself – it is part of a larger system, and successful integration means more than selling a wind turbine. So superwind set about to build a better charging strategy, and in doing so achieved a new milestone. The key is to combine the Auto-Feathering Overspeed-Avoidance system with a diversion control charging system. This way, the turbine can be left working continuously, allowing unattended operations (making power) at all times. By charging the batteries within the manufacturers specifications and dumping the power only after the batteries are fully charged, we have created a charging system that is truly autonomous, reliable and highly efficient. Today our system is so advanced that we are offering the only micro-wind turbine ‘Valance Verified’- meaning we are qualified to charge Lithium Iron Magnesium Phosphate (LiFeMgPO4) batteries and energy storage systems. Another question we are frequently asked is whether we can work with other charge sources? YES! The Superwind was designed to work alongside solar panels, fuel cells, etc., and we are often partnered with diesel generator systems as we are great in delivering fuel conservation advantages in windy areas. 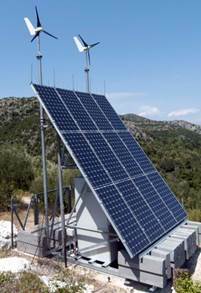 If you think about it, our reputation is based on the off-grid professional, hopping aboard a $4,000.00 roundtrip helicopter ride to a communication tower atop a mountain to install a micro-wind turbine which helps to power lifesaving equipment. You might ask if that is the time to save money by using a cheap hobby wind turbine? For our experienced customers, the answer is clear. And that is the reason why every Superwind is tested to the same high standards. There are many mast options to integrate a Superwind. The good news is that often a Superwind can be installed on locally sourced mast structures, even those masts once occupied by failed turbines! 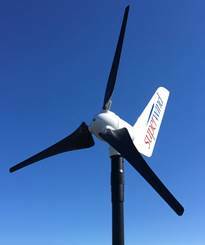 Once properly installed, the Superwind can work for decades where the other turbines failed in months or weeks. The SW350 (standard version) shares all the features described above. It is available in DC output; 12v, 24v (28.8v) or 48v. This series includes a Delrin Mast Integration Bushing, but for towers and high wind areas, an optional Stainless Steel Yaw Mount Bushing is available. 12v, 24v and 48V SW350 turbines are also available as kits; with charge controller, safety switch and dump load resistor included. The Superwind 353 Turbine shares all the features of our standard turbine package. 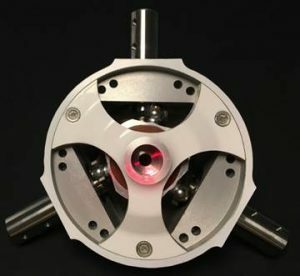 However, we have added a back bearing assembly along with the new Patented Pending STAR Hub™ over-speed control system. This turbine is ideal in mid-tower integrations where the danger of falling ice may be present. It is also ideal in areas prone to vandalism (including border security), mine wall blasts, or in areas subject to high crosswinds over 80 knots or extreme turbulence (high slopes, cliffs or mountain tops). 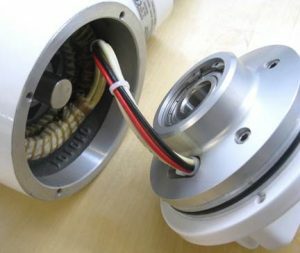 Why a SW 353 Unit? When a Superwind blade is damaged by any means on a standard turbine, the entire blade set should be removed as soon as possible to avoid damaging the turbine. If the Superwind 353 is used instead, the turbine can survive longer periods of operation with damaged blades and may be salvaged once repairs are finally possible. The superwind 353 turbine is the choice for serious mission critical roles where once installed, revisiting the site is impossible for months at a time, and/or where winds are likely to exceed the 100mph survival rating of the SW350. Nature can destroy anything – but this is the toughest Superwind built to survive most of it. The SW353 version is available in 12v , 24v (28.8v) and 48v. All 353 series turbines include a Stainless Steel Mast Bushing. 12v, 24v and 48V SW353 turbines are also available as kits; with charge controller, safety switch and dump load resister sets included.